Sarah is an Astronomer and Instrument Scientist working for the European Space Agency in Baltimore, MD, as member of the James Webb Space Telescope (JWST) mission office. 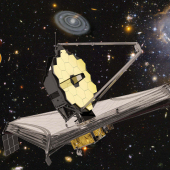 JWST is a major next-generation infrared space telescope to be launched in 2021, built as a collaboration between the US, European and Canadian Space Agencies (NASA/ESA/CSA). Sarah specifically works on JWST's mid-infrared instrument MIRI, and has been a member of the European MIRI consortium since 2007. She has a PhD in Physics from University College London (2006), and has previously held positions at the University of Leiden, Netherlands (2007-2010), the Max Planck Institute for Astronomy in Heidelberg, Germany (2010-2013), and the University of Oxford, UK (2013-2016). The cost will be $45 payable online via PayPal. We ask that you PLEASE pay for the dinner when you Register for the meeting or at least a few days in advance so we can have an accurate head count. If you plan on paying with cash or check notify Michael Firth!